Nureva is a new company that was started by the couple who created SMART Technologies and interactive whiteboards and today, they’re releasing a new product. It’s called the HDL300 audio conferencing system and it uses the company’s breakthrough Microphone Mist technology, which can place more than 8,192 virtual microphones in a meeting room, so sound can be picked up from any location. The system is using real-time hardware, sophisticated algorithms to simultaneously process sound from all the virtual microphones. The main reason for the HDL300 audio conferencing system is to resolve some of the issues of poor audio pickup during conference calls. 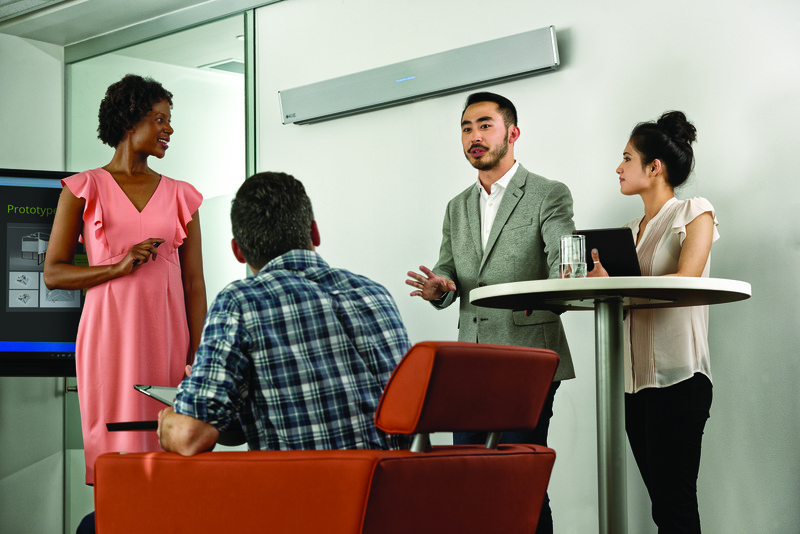 The system can be used in small to mid-sized meeting and collaboration spaces. It’s also compatible with Skype for Business, Zoom, Blue Jeans, Cisco Spark, Cisco WebEx, GoToMeeting, Pexip Infinity Connect and more. In order for the system to work, your conference/meeting room will need a computer with UC&C, web conferencing or video conferencing software (such as the ones listed above). The system is designed to be plug and play, and connects to a computer over USB. The HDL300 system is available now from authorized Nureva dealers and distributors in North America, Western Europe, Australia, New Zealand and South Africa. The system is $2,999 USD and comes with a two-year limited warranty.